Have you ever looked for a way to show advantages and disadvantages of 2 options? One way to compare options is with the Balance SmartArt layout. It looks like a scale. What’s so cool about it is that it tilts based on the number of items on each side, creating a very visual way to show which option is best. 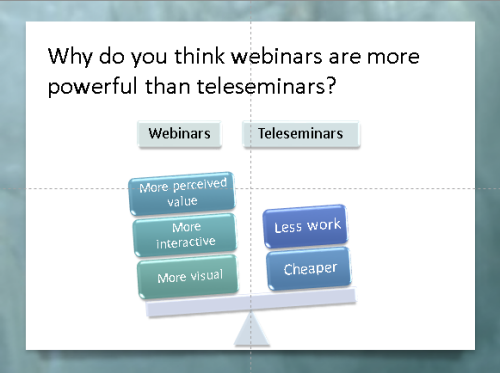 Here’s an example slide that compares webinars with teleseminars. Use a Title & Content layout. Click the Insert a SmartArt Graphic icon in the Content area. In the dialog box’s left-hand pane, choose Relationship. 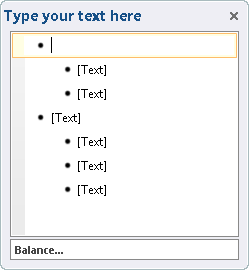 Then choose the Balance layout. Click OK. The Text box opens on the left side of the SmartArt diagram. Enter the 2 headings next to the 2 bullet points that are not indented. Enter up to 4 items for the indented bullets. Can you think of a use for the Balance SmartArt layout? Take a look at some of the other layouts in the Relationship category. Some of them are quite nice. 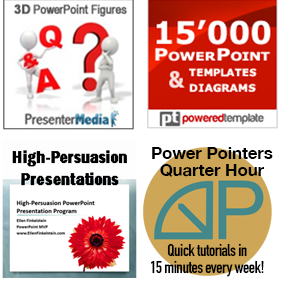 I’ve been using PowerPoint SmartArt for years, yet I didn’t notice the balance diagram. Thanks!